Do you currently use Dental software? While dental software has been around since the 1980s, few dentists can say they have a truly “paperless” office. Practice management systems such as Dentrix, Carestream Health, and DentiMax have seen widespread adoption, but fewer dentists use software for charting or clinical documentation. A recent study published by the American Dental Association showed that 73.8 percent of solo practitioners and 78.7 percent of group practitioners now use electronic dental records. Looking at the data though reveals that just 14.3 percent of solo practitioners and 15.9 percent of group-based practitioners are actually using digital charts or documenting patient notes electronically. Even so, adoption numbers are rising as the costs for electronic dental records, practice management, and digital dental radiography systems fall. Choosing the correct system, however, can still be difficult, as many systems can’t be integrated. Practices using intraoral or phosphor plate digital imaging sensors in particular can find their choices somewhat limited if they want to avoid duplicate data entry. Which Dental software is right for your practice? Dental software goes by a few different names, including electronic dental records (EDR), electronic health records (EHR), dental practice management, and dental office software (DOS). It can be organized into four main verticals: clinical, administrative, imaging, and patient engagement. Of these four, two will be covered in this guide: clinical and administrative. The most popular, and arguably the best dental software solutions satisfy both the clinical and administrative needs of dentists with pre-integrated practice management and clinical systems. Dental imaging software is usually developed by manufacturers of digital dental radiography sensors. This means that once a provider chooses a vendor for digital imaging, they are essentially locked in to using that vendor’s imaging software. For the purpose of this guide, we won’t focus on dental imaging, but will note which systems can directly integrate with popular imaging solutions. The best patient engagement systems integrate with some of the best dental software, and provide an online interface where patients can schedule appointments, fill out registration forms, request prescription refills, pay bills, and more. Patient engagement (or patient portal) software is discussed at length in the TechnologyAdvice Buyer’s Guide to Patient Portals. As more dental software vendors trend towards offering all-in-one solutions, it can be difficult to keep track of the ever-expanding feature lists. The following is a breakdown of the most common features, along with a brief description. The software includes a graphical representation of the periodontal chart, which can include individually clickable teeth, 3D modeling, etc. The software allows dentists to electronically document progress notes, orders, patient history, and more. The software allows dentists to create and send prescription notes via an electronic prescription pad, and is usually linked with SureScripts or another electronic prescription service. The software allows patients or front desk staff to input patient demographics, health history, and insurance information electronically. The software allows staff to schedule patient appointments with an electronic calendar. Some systems also support provider and operatory scheduling. The software allows dental offices to electronically generate and submit claims to insurance for reimbursement, and usually includes provisions for billing self-pay patients and processing payments. While some providers prefer to have their software systems installed on an on-site server, an increasing number of dental professionals are opting for cloud, or web- delivered dental software. Because offices have to invest in equipment as well as software licenses, on-premise systems usually have higher up-front costs. On-premise systems must also be physically and electronically secure in order to comply with HIPAA regulations, and providers must create and maintain their own backups of patient records. Cloud-based, or Software-as-a-Service (SaaS) systems, in contrast, have much lower up-front costs, since there is no need to invest in expensive servers. Since cloud-delivered software is almost always subscription-based, there usually isn’t an initial software licensing fee. This means the total cost of ownership for cloud-based systems is typically higher than comparable on-site systems, as dentists must continue to pay the monthly fee as long as they use the software. The tradeoff is that the vendor is responsible for maintaining servers and data security. Server uptime for SaaS providers can sometimes be a concern, but the majority of vendors guarantee 99 percent or better uptime. It is far more likely that your Internet Service Provider (ISP) will have an outage than most SaaS dental systems, so a backup ISP is recommended for providers who choose cloud-based software. Web-based systems are also easier to access on tablets or other mobile devices, in or out of the office, than comparable on-premise systems. 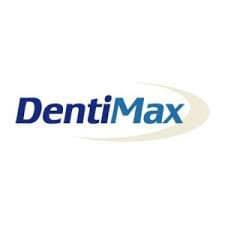 DentiMax has been providing clinical, administrative, and imaging sensors and software to dental professionals since the early 2000s. Their platform offers a complete solution for dental practices. For clinical aspects of your practice, this includes electronic periodontal charting, encounter notes, and prescriptions. For administrative aspects, it features billing, scheduling, and patient registration, not to mention both sensors and digital radiography software for imaging. 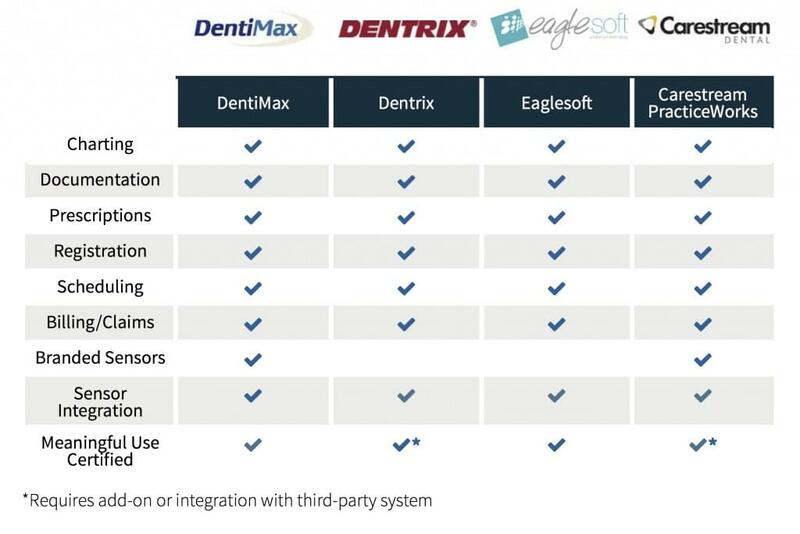 Unlike many competitors’ systems, DentiMax can directly integrate with almost every sensor currently on the market (with the exception of Dexis sensors). The software closely resembles Windows 7, and as a result, has a minimal learning curve for most providers. Dentists are eligible for Meaningful Use incentives, but few are participating. Program data from the Centers for Medicare and Medicaid Services (CMS) reveals, that as of October 2014, less than four percent of the eligible professionals who participated in the program were dentists. According to the Kaiser Family Foundation’s (KFF) list of professionally active dentists , fewer than 10 percent of active dentists have qualified for incentives. In contrast, the participation rate among physicians is nearing 50 percent, according to both CMS program data and the KFF’s list of professionally active physicians.